Newsletter SYRPA has agreed to share information with the Friends of North Bloomfield & Malakoff Diggins Park Association. Visit the newsletter site of our co-operating association. Newsletter SYRPA has also agreed to share information with the Empire Mine Park Association. Visit the newsletter site of our co-operating association. 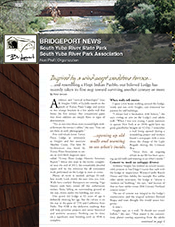 The Newsletter is published quarterly on behalf of the State Park and the Park Association. Email notification is made to our members, volunteers, Park staff, the local community, our business sponsors and the media. Copies are mailed to members and volunteers who do not have email.